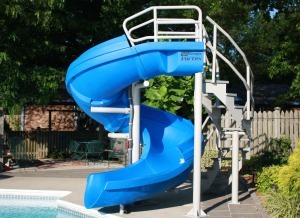 For high end residential spaces or commercial uses, the SR Smith Vortex water Slide is a good choice. It’s Vortex’ top of the line swimming pool slide and would look good in any big backyard. And of course, children will have fun on it too. There are a few choices you need to make when you buy the Vortex Slide by Sr Smith. First, you need to decide whether to have a ladder or spiral staircase. You also need to decide whether to get an open or closed Flume. The height of the Vortex Pool Slide is 10′ 7″ (7’6″ to the seat). It has a 19′ long flume that’s 32 inches wide. It weighs over 325 pounds. Maximum weight capacity of 325 lbs. The package arrive in two pallets with a combined shipping weight of 1350-1860 lbs. The pallets measure (may vary depending on where you buy it from) 57″L x 128″W x 72″H for the first pallet and 39″L x 150″W x 48″H for the second pallet. The ladders are enclosed for maximum safety. They’re shaped in a semi circular hybrid made of HDPE weather slip resistant surface. The steps are spaced 7.5 inches and 9 inches deep. The flume is made of roto-molded polyethylene. It is 19-foot long and has a 360 degree corsksrew style. This can be either closed or open. Here are some pictures of the SR Smith Vortex slide for inground pools. 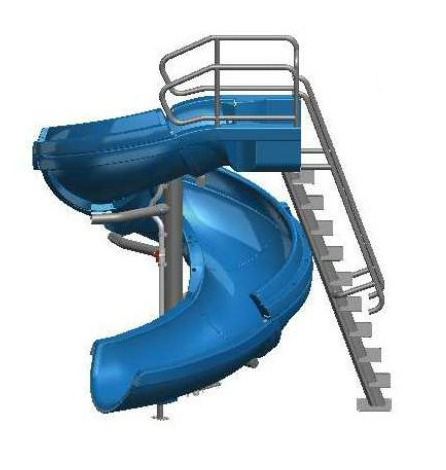 Now see the Sr Smith Vortex Water Slides for inground pools in videos. Here’s the first promotional video giving you a clearer picture of what you get when you buy the Sr Smith Vortex Slide. A 360 degree look.